You are here: Home / Blog / 2011 November – Where’s Zippy? 2011 November – Where’s Zippy? 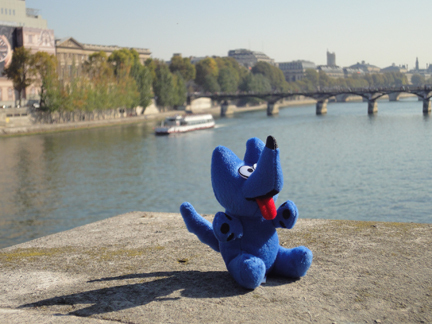 Once again, while we are hard at work here at the ZippyDogs World Headquarters… Blue Zippy is out gallivanting around the world. This time he is wandering the streets of Paris with his good friends Cheryl and Tracy. Though we are all terribly jealous, of course we are living vicariously through his adventures, C’est la Vie! 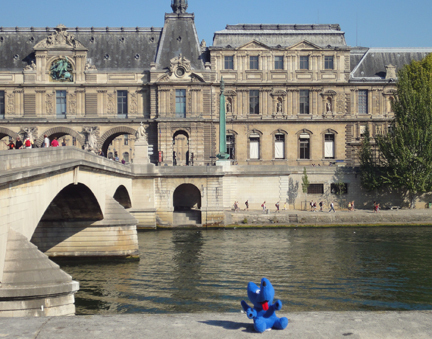 In this picture he is enjoying the start of fall by sunning himself along the Seine River. The smell of fresh crêpes wafting through the air.